An interview with William Arteca, to discuss the how centrifuges are used in Neuroscience research and introduces a new product for high-speed lab applications, conducted at SfN 2018 by Alina Shrourou, BSc. How can centrifugation as a separation technique be used in neuroscience research? Neuroscience research is very molecular biology based, so there is a lot of sample preparation and other biology-based analytical techniques, such as western blot and gel electrophoresis. A centrifuge is an essential part of any lab, especially in molecular biology, because it is routinely used in sample preparation. How do researchers determine what level of centrifuge force is needed for their specific brain research applications? There are two ways: trial and error or standard operating procedures. With trial and error, you develop your own procedure and methods. With standard operating procedures, you follow what you find online or from other scientists. What challenges do scientists face when performing high-speed centrifugation on their samples? Some of the main challenges are determining what speed to do it at and determining if the sample is temperature sensitive. This is important, in order to ensure that it doesn't degrade while you're centrifuging it. In addition, a centrifuge is a very sensitive machine when it's not used correctly and so one of the biggest challenges can be determining the rotor size and what attachments to use for it, such as swing out, fixed angle, and tube size. How do the products you presented at Neuroscience 2018 overcome these challenges? We are launching our centrifuge, the Frontier 5513, in about a month, which will help overcome those challenges because we have multiple rotors that go with it and our rotors are very easy to change out. Ohaus’ centrifuge is not a typical one where you have to unscrew the rotor and it takes a few minutes, but rather one you can pop it in and out, instantly. We also offer many different sizes; including ones specifically designed for spin columns as well as fixed-angled rotors designed for twenty-four 1.5 ml tubes. Having a multitude of readily available rotor options allows a scientist to quickly alter an experiment without dramatically effecting sample exposure time. How is this product unique compared to other high-speed micro centrifuges on the market? My favourite part of the Frontier 5513 is the sleek touch wheel. It removes the need for an analog dial ensuring that no materials can enter through the mechanics. This removes the material build up under the interface that you might have with other centrifuges. You also don't have to take your gloves off to use the wheel as it is highly sensitive. Small features like that tend to make the difference between a successful and an unsuccessful experiment in a laboratory. 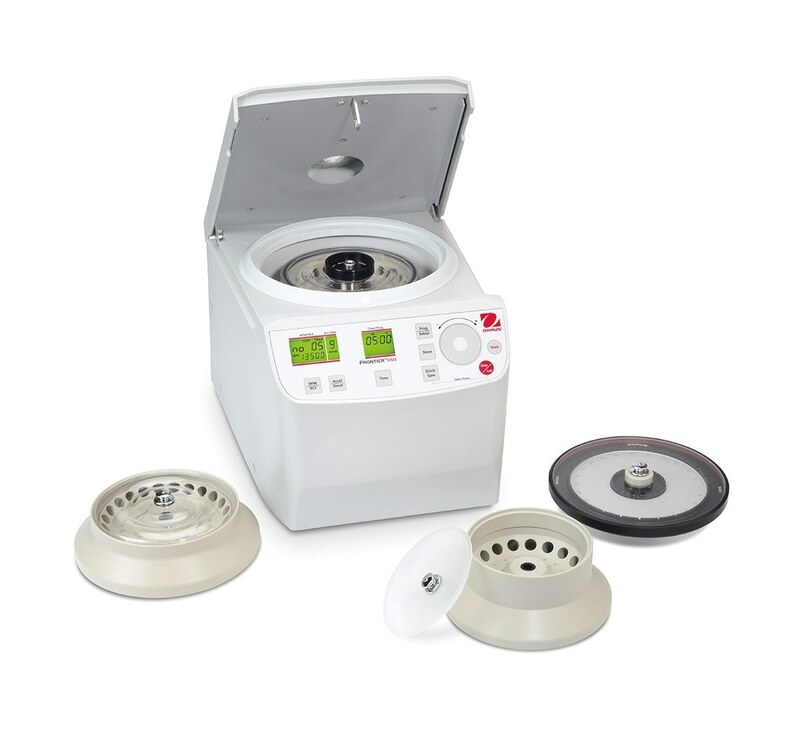 Is the Frontier 5513 the right centrifuge for your high-speed lab applications? How do you expect your new high-speed microcentrifuge to advance life sciences research? The Frontier 5513 is sensible from a price point and we have a unique interface, making it more interactive, and it has a small footprint so you're able to have it on a small bench space with a bunch of other equipment. Overall, this makes researcher's life easier whilst performing experiments – so anything we can do to keep processes efficient for scientists I am sure reflects in their research results. In addition, I think research would be advanced because it's an easier tool. The touch wheel interface might improve laboratory procedures because it’s a smoother system that people are familiar with it, especially the younger generations. Therefore, it could reduce the risk of human error, leading to more accurate and valid results. OHAUS Corporation is a manufacturer of high-precision laboratory balances, industrial scales, moisture analyzers, pH meters as well as a newly launched line of high quality bench top laboratory equipment. With its expansive portfolio, OHAUS is a global leader in the laboratory, industrial, education and life science markets as well as various specialty markets, including food preparation, pharmacy and jewelry industries. An ISO 9001:2008 manufacturer, OHAUS products are reliable, affordable and are backed by industry-leading customer support. Sponsored Content Policy: News-Medical.net publishes articles and related content that may be derived from sources where we have existing commercial relationships, provided such content adds value to the core editorial ethos of News-Medical.Net which is to educate and inform site visitors interested in medical research, science, medical devices and treatments.